Ramakant is from Odisha. (Orissa) He is educated till the 8th. Primarily farmers, like his father he too tilled the land until 6 to 7 years ago. However, the income from agriculture could not sustain them. He decided to migrate to Mumbai and sell betel leaves, the same he was once cultivating back in the village. Ramakant has 3 sisters and 2 brothers. His sisters are married. Ramakant got two of his sisters married. His mother suffered from cancer for many seven years, and they spent their savings on her cure. It fell short, so, they sold their ancestral land to raise Rs One and a half lacs for her further cure. That too fell short. They then borrowed around ten to eleven lac rupees from relatives for her cure. They spent that too on their beloved mother. But they lost her to death. Ramakant’s mother passed away one and a half years ago. But their debt is alive. It returns to haunt him every month, when the next loan installment is due. Ramakant continues to pay off their family debt month after month, ever since then. Looking at his old bicycle, his soiled clothes, weak body language, and no glimmer of hope in his eyes, saddened me. I felt that for a man like him, in deep debt, paying off a debt of six lacs in monthly installments selling Paan leaves, for such a man the months must be arriving faster than the speed at which Hailey’s fascinating comet travels through space. He still owes six lacs to his lenders, and knows he has to pay it back. The margins they earn are so tiny, I wonder how much sacrifices they need to make to pay back loans of such quantum. His sorrow is not that he has a debt of six lacs to pay back. His greatest sorrow is the loss of his soul mate – his mother. He told me, “Saab, meri Maa ke marne se meri aadhi zindagi khatam ho gayee. Jab se Maa chalee gayi, tab se main toh aadha ho gaya hoon. Meri aadhi zindagi meri Maa ki diya hui thi, mujhe toh aisa lagta hai unke chale jaane se. Ramakant’s loss of his mother reminded me of a heart wrenching song my father wrote back in the 60’s, in the film Chhota Bhai: https://www.youtube.com/watch?v=HaXn0Fz2ARk , expressing the loss of a soul mate, Mother. I miss my mother too, immensely. 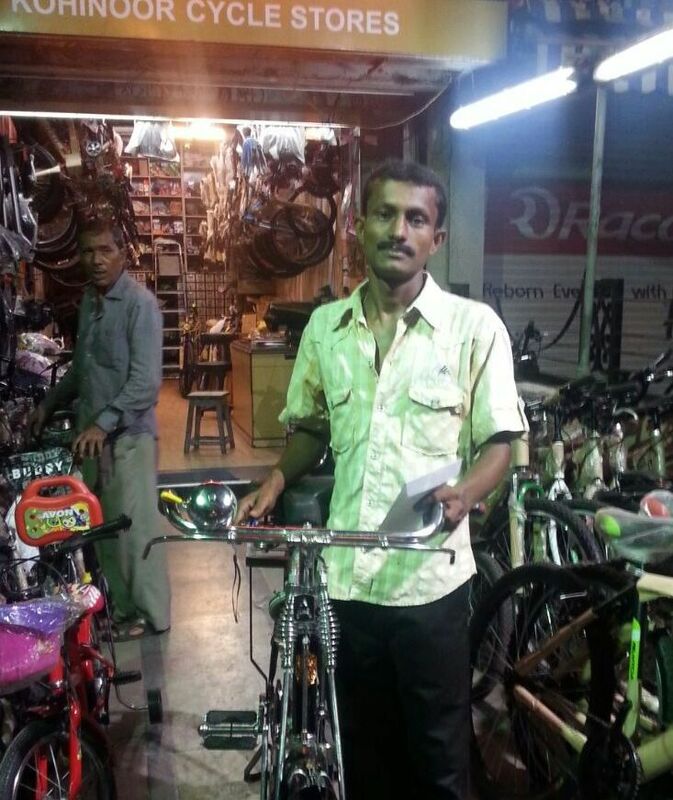 We decided to uplift Ramakant’s livelihood prospects, in our own humble little way, by buying him a new bicycle. The advantage of having a new bicycle would be, Ramakant said he will now be able to travel, ride longer distances. Thus increasing the prospects of his income, his trade, even though the amount will be quite marginal to begin with. For us, this is a good enough reason to help him, and millions of others like him. Another thing, we privileged people may consider people like him ‘under-privileged’, but even they have something to give those who have far less – Ramakant donated his old bicycle to us, because we hope to further donate his old bicycle to a tea seller who needed one to better his income prospects. So, you are never too poor to help another. Moreover, Ramakant even contributed Rs 500 towards the purchase of this new bicycle, even though he donated his old one to help another person. So, we need to keep pedaling for those who are dependent on us. At the loss of a loved one, do not lose hope that the Sun will not rise again, because at least he Moon shines when the Sun goes down on us. Even moonlight is ‘light’, which is hope. Is what I tried to convey to Ramakant Dey. 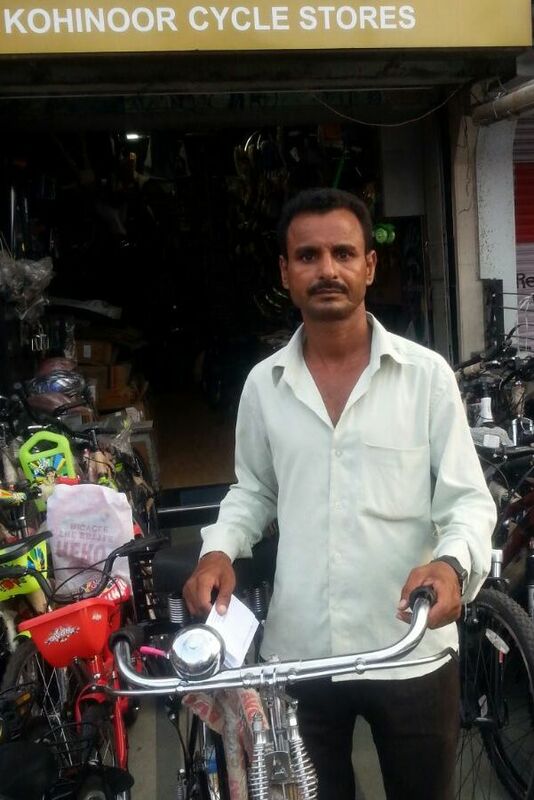 Thank you to Parag Parekh and Shaad Randhawa, for purchasing this new bicycle for Ramakant. Pau (bread) and Milk seller. Aslam is from UP. His father passed away when he was around one year young. His mother, and his three elder sisters, mothered and fathered and mothered him. After his father’s demise, his mother and his four sisters, all four elder to him, took the reins of their family’s livelihood in their nimble hands. Literally. You need nimble fingers to roll beedis. They made them for a local manufacturer of the indigenous cigarette. A beedi is a thin ‘cigarette’ filled with tobacco flake and wrapped in a tendu leaf, tied with a string at one end. The name is derived from the Marwari word ‘beeda’ — a leaf wrapped in betel nuts, herbs, and condiments. When I began working in films, in 1999, I found out that actor Jackie Shroff loved to smoke beedis. I was fascinated. Until then I had never seen anyone other than the lower income status people smoking beedis. Aslam has never been to school, because the income from even his four sisters and mother rolling beedis could not sustain his school education. He was the youngest, with two elder brothers. Aslam has two daughters and for some unknown reason both get sick on and off right from their childhood. One is a less than a year or two young, and the other is around five or six years old, I think. The evening I first met Aslam on the street riding with his goods, I think he had a little fever. And in spite of being a young man, he was not riding at a speed someone as young as him usually does. His bicycle was in a very bad shape. Later, when he came over to meet me for his interview, I found out that he has had fever since a few days but has not been taking any medicine. Then he admitted, that a day ago one of his clients’ forced him to take medicine and even purchased it for him. He showed me the medicines gifted to him by his client. I made Aslam understand, that if he does not take medicines when necessary he could fall more ill, and may be unable to earn even the Rs 200 a day he mentioned. He needs to take medicines in time to stay well for his family. After all, his two daughters and wife and his mother, all of them are dependent on him alone. And he seemed so stressed about his two daughters, so he needs to stay well for them. He nodded in silence. But I wasn’t sure if he agreed. I asked Aslam, considering he is worried or stressed about his two daughters continued ill health, he must be really missing them living so far from them? I asked Aslam, when was the last time he went to his village? When was the last time he saw his family, his daughters? Because, I know from meeting many of them that they go to their village once a year for about two months. This is where I wanted to end his interview. I recollect, my father too had to stay away from his family, my mother and my elder sister, for nearly 5 years when he was struggling for a break in Bombay in films. He left his army job to come to Bombay and sent my mother and elder sister to Lucknow to her parents’ house and there was a time he could not afford to go see them for three years. Maybe because he himself had faced similar circumstances in his own life, my father could write this song so well from the ink of his own soul. I was honest. I told him I have no work to offer him. However, if he wants us to repair his old bicycle we can do that for him, along with buying him a new one. So that he can own two good bicycles and employ someone to do what he is already doing, and share the income appropriately. With one more bicycle ferrying goods his income will improve. Aslam said he will think about our offer. He will try to find a hardworking and trustworthy person to join hands with him. My friend Siddhi Sanghvi, she happened to call me that same day I met Aslam. I mentioned to her that I met a vendor who has not been home to see his daughters for over a year, because he cannot afford the train fare home. She volunteered to buy his two way fare. Accordingly, I gave Aslam her offer. I happened to meet Aslam a few days ago, on the street riding. He told me he is, finally, going home on the 16th to see his family, this week, for Eid. He asked me if I have an old children’s bicycle to gift his daughter. I do not, I said. But he did not seek the two way train fare we had offered him. Aslam’s daughters will be happy this Eid. After all, their “Abbu’ listened to them this year. This Eid, just like Aslam, lets close the gap, if any, between us and our loved one. Happy Eid. Speaking of daddies and daughters, let us end our tale with a random but beautiful quote. “The father of a daughter is nothing but a high-class high-caliber perpetual hostage. He may turn a stony face to his sons, berate them, shake his antlers, paw the ground, snort, runs them off into the underbrush sometimes! But when his daughter will puts her arm over his shoulder and say, ‘Daddy, I need to ask you something,’ or ‘Oh daddy I need your help’, Daddy will become a pat of butter in a very hot frying pan. 😉 :)” – Garrison Keillor. Thank you to Gajra Kottary, Surabhi Shah and Anupama Chibber for purchasing this bicycle for Aslam Khan.